You can now purchase Kettler garden furniture from the Garden4Less website! With 4 ranges to explore, we're sure that you will love these high quality, super-stylish outdoor sets. From the elegant weave of the Charlbury range to the sleek, modern lines of Siena, there is something for every garden. Hanging egg chairs are proving to be hugely popular for 2019 and we have a selection to choose from on our website. Ideal for gardens of all styles, these sleek cocoon chairs are available in single or double sizes and deliver gravity defying comfort. Order a brand new egg chair today! Hartman garden furniture is back with brand new ranges and colours for 2019. Keeping much loved existing lines such as Amalfi and Berkeley, as well as introducing brand new ranges such as Curve and Heritage, there is a huge variety of styles on offer, making it easy to find the right furniture for your garden. The Rockwood Storage Box is a firm favourite on the Garden4Less website. Available in two colours, dark brown and anthracite, this robust resin box is perfect for storing away furniture cushions, kids toys or any other outdoor items. Discover the Rockwood Storage Box today. You can now buy Kettler garden furniture from the Garden4Less website. We have four fantastic ranges available: Charlbury, LaMode, Palma and Siena. Whether you'd like a sophisticated weave corner set, or a sleek, modern metal dining set, Kettler has something for almost any garden. We have 0% interest finance options available making it easier than ever to buy a fantastic new furniture set for your garden this summer. Hartman is back for the 2019 season with some exciting new changes. With the addition of two new weave ranges, Curve and Heritage, and brand new colours for existing cast aluminium ranges, there has never been a better time to buy a brand new Hartman furniture set! Whether you'd like weave, cast aluminium or wooden garden furniture, Hartman have got something for you. 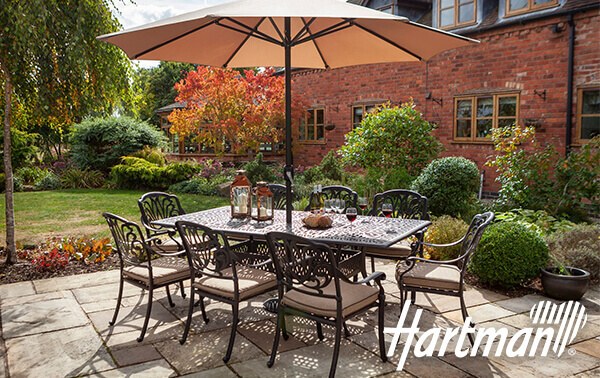 View our 2019 Hartman garden furniture today and find the perfect set for your garden this summer. Winawood is perfect if you want wood-effect garden furniture without the hassle of regular upkeep. Made from hardwearing synthetic materials, this furniture can be left outside all year round! Create a bespoke lighting system for your back garden with Ellumiere's easy 3-step process. Simply choose lights, select your cables and connectors and add a transformer to connect it to your power source. Simple!